We scheduled dinner out with a wonderful group of friends in Heidelberg. These neat folks are whom I usually refer to as "the usual suspects." With that being said, of course I wanted to take a cake for dessert for all of us to share. I baked the cheesecake first and let it set-up in the cake fridge overnight. I put a bit too much batter in the spring-form pan which resulted in a thicker than anticipated cheesecake. Not that anyone minded, but it was just something to call out. I baked my favorite go-to chocolate cake; I accidentally baked the cake at the cupcake time and not the layer-cake time. Under-baking can lead to a cake that falls in the center or a cake that doesn't hold together [read: easily crumbles]. Crumb-coating isn't usually this destructive. Knowing that I wanted to frost the cake with a ruffled ombré, I crumb-coated the cake with Vanilla Buttercream. Crumb coating was an extra challenge due to the under-baking, but it certainly wasn't fatal. 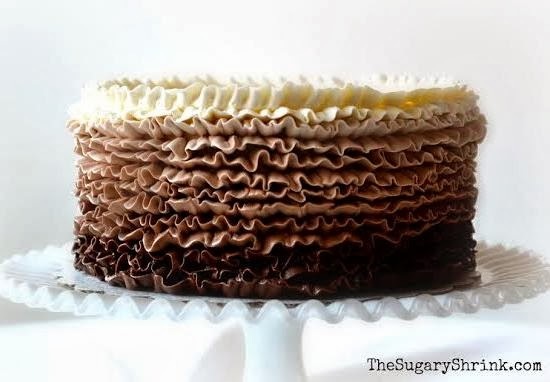 Because of the change in color of the frosting, the bottom half of the cake needed a coat of chocolate buttercream as the background in case some of the base was noticeable through the ruffles. The final layering of vanilla is primarily just the top surface. The first couple layers of ruffles are vanilla and then I slowly added chocolate ganache (55% dark chocolate and heavy whipping cream). By the bottom layers, it was just whipped ganache with a bit of added powdered sugar. This cake was particularly heavy...literally. 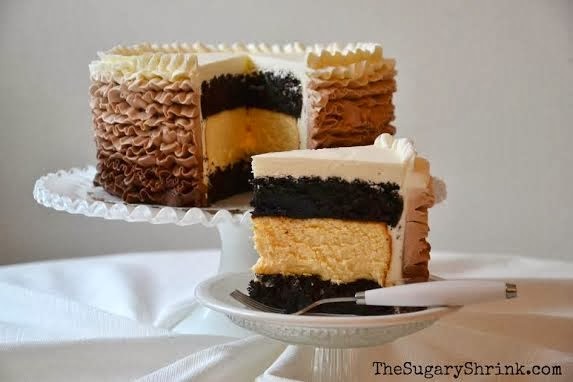 The middle layer of cheesecake weighs in at just over two pounds...not including the layers of chocolate cake or the buttercream. While taking these snapshots, I realized my Fiesta Ware Dancing Lady Cookie Jar sports a ruffled skirt. Maybe I need to decorate a cake with turquoise ruffles. The Usual Suspects really seemed to like this cake. And we had a fun evening with friends...catching up, laughing, sharing stories, and enjoying a slice of cake. 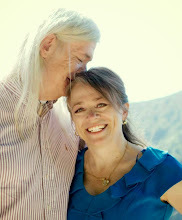 Living life on life's terms with my Life Partner. Good stuff.